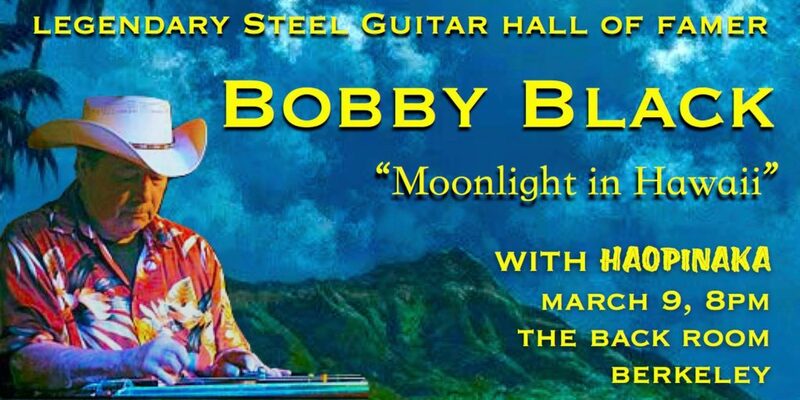 Steel Guitar Hall of Famer Bobby Black headlines “Moonlight in Hawaii,” an enchanted evening of Hawaiian steel guitar, hapa-haole classics, and hula dances. Bobby will be playing his favorite Hawaiian songs, backed by special guest musicians, singers, and hula dancers, including Myles Boisen, Tony Marcus, Sheilani Alix, Leila Bou, Nadine Revecho Vargas, Casey Vargas, Jill Rogers, Sil Castillo, Rod Valdez, Peter Garellick, Vanessa, and Hui Hula o Na Pu’u i ka Noe. Opening set by Bay Area Hawaiian band Haopinaka.